7/2009: The Session, or governing body, of the First Presbyterian Church of Ewing has announced plans to proceed with demolition of the sanctuary, despite congregation uproar. Read more detail on the PNJ Blog. 8/2009: PNJ has offered to acquire the sanctuary of the First Presbyterian Church of Ewing. The offer was quickly refused by the church Session. Read more here. 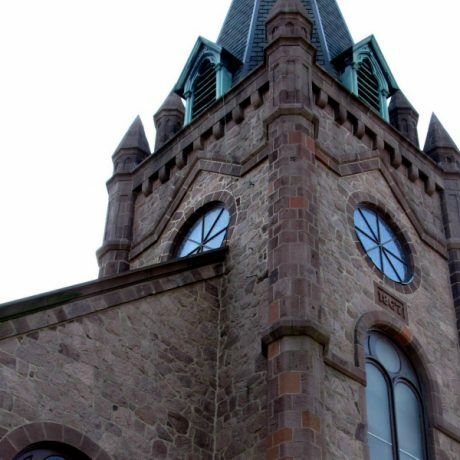 9/2009: The New Brunswick Presbytery has announced its plan to appoint a seven member Administrative Commission that will have as its sole responsibility determination of what the Ewing congregation will do with its 142-year-old house of worship. The commission will review structural reports, interview congregation, and community members and examine all aspects of the previous decision-making that led to the church Session’s decision to demolish. Spokesmen suggest the commission’s work will be complete by the end of 2009. 3/2010: The Administrative Commission has announced that they will undertake an independent engineering assessment of the historic 1867 stone sanctuary. 4/2010: On April 20, the Administrative Commission announced that the church has declined the New Jersey Historic Trust Grant awarded for further study of the stone sanctuary, citing concerns with the requirement of grant receipt that the sanctuary is nominated to the National Register of Historic Places. Their open letter announcement asserts, “While we hold high regard for the New Jersey Historic Trust and its work, we do not believe involving ourselves in a complex bureaucratic process is good stewardship of our time and talent.” The letter indicates that funding for the proposed independent engineering assessment will come from the PRES Coalition funds previously raised for restoration, and a pledge of matching funds from the New Brunswick Presbytery. 8/2010: On August 20, the Administrative Commission released their long-awaited report, which called off demolition of the historic stone sanctuary, stating that the building is not in imminent danger of collapse and indeed requires far less costly repairs than church leaders have led the congregation to believe. The report presents the congregation with three options: restore the building for continued use as their house of worship, sell or donate it to another organization (such as another congregation), or lease it to another organization for restoration. The report is only a recommendation: it awaits September 14 approval by the New Brunswick Presbytery. 10/2010: The Administrative Commission’s report has been approved and discussions continue regarding the future of the stone sanctuary. The Administrative Commission now holds jurisdiction over the building and is responsible for all relevant decisions. 1/2011: The Presbytery of New Brunswick and Preservation New Jersey are working on an arrangement that would allow PNJ to lease the building, eventually turning the lease over to a separate, to-be-established non-profit. 4/2012: After over a year of negotiations, PNJ has signed a 50-year lease for the historic sanctuary building, now to be known as the 1867 Sanctuary at Ewing. Plans to repair the roof trusses are now in progress as PNJ continues fundraising to effect those repairs and the building’s complete rehabilitation. Please see the effort’s website for up-to-the-minute information on this success story in progress! You can donate to help save the 1867 Sanctuary at Ewing here. The First Presbyterian Church of Ewing occupies 58 acres of land in Ewing, New Jersey. The site accommodates a campus of associated historic buildings, dating from 1867 through the 1950s, and the church’s historic cemetery, which includes legible gravestones dating as far back as the 1720s. Time, however, has taken its toll on the building, and the congregation’s governing body is now threatening to complete the process. The church retains its original slate roof, under the weight of which periodic measurements over the past 40 years have demonstrated that the walls of the building are straining and bowing outward. In 2005, the congregation raised over $100,000 to fund a structural engineering firm’s effort to repair the trusses supporting the roof. However, in March 2007, the building began showing more alarming signs of deterioration when ceiling debris dropped into a part of the sanctuary. As a result, the church’s insurance carrier then refused to cover the building, and, due to lack of funds and potential liability, the congregation’s deliberative body announced the decision to raze the sanctuary building. While some professionals have suggested that any potential remedies would cost upwards of $1.5 million, others have suggested that less costly measures of stabilization and repair are likely to solve the structural issues. However, the funding required for any of the potential solutions will be significant. Ewing Presbyterian Church’s congregation has remained overwhelmingly dedicated to saving the sanctuary building throughout this challenging situation. As a result of member activism, the building was re-insured in 2008 with the help of the National Trust for Historic Preservation, and as a result, in November 2008, the church’s deliberative body approved a six-month moratorium on irrevocable actions involving the sanctuary. The moratorium was designed to allow for a period of fundraising and advocacy to save the church. Since that time, church members have placed collection buckets at businesses throughout Ewing and surrounding municipalities and have hosted various fundraising events. In the face of effective efforts, most recently, the moratorium was extended through June 30, but as that deadline also draws near, funds are still needed. While churches throughout New Jersey have suffered the often-detrimental effects of changing congregations and communities, the First Presbyterian Church of Ewing remains an intact representative of Ewing’s past and a significant element of the township’s unique built environment. Preservation New Jersey believes that the demolition of this landmark would constitute a tragic loss. This building’s fate remains in jeopardy unless funding can be secured before it’s too late.